Learn about USAID prime awards. Search for subcontracting opportunities. Research the competition: size of award, country and program sector. Discount for U.S. Small Businesses ....and more. Even a small organization with basic infrastructure can be successful with our courses. Our courses help level the playing field—bringing them to you in a tailored and understandable way. Our consulting services will take your organization to the next level. See what our clients are saying about Development Essentials. Working with Development Essentials has been an amazing learning experience, a great confidence builder and financially beneficial. Chris O’Donnell guided us through the grant process; teaching us how to understand the donor application, how to write proposal content that addresses the questions in the application yet stayed true to our mission, the importance of documenting our submission date and time, and finally the art of follow-up. Development Essentials taught us the process – not just how to fill out the application. Thank you Chris! Development Essentials offers three consulting services at a fixed price. Many of our clients view these consultancies as useful follow-up assistance to our most popular courses. Executive consultations are designed to assist senior leadership address with the most challenging strategies and issues facing contractors and grantees. Our team can analyze and provide a strategy for RFPs, RFAs, APS’, associate award and task order solicitations. As a consultation we can offer a review of your draft technical application and cost application. Chris O’Donnell has over 33 years of service with the U.S. government. Most recently as a consultant and founder of Development Essentials, a Limited Liability Company registered in Virginia. In this capacity he has advised U.S. Private Volunteer Organizations (PVOs) and for profit organizations regarding all aspects of winning USAID awards and effective managing contracts and grants. 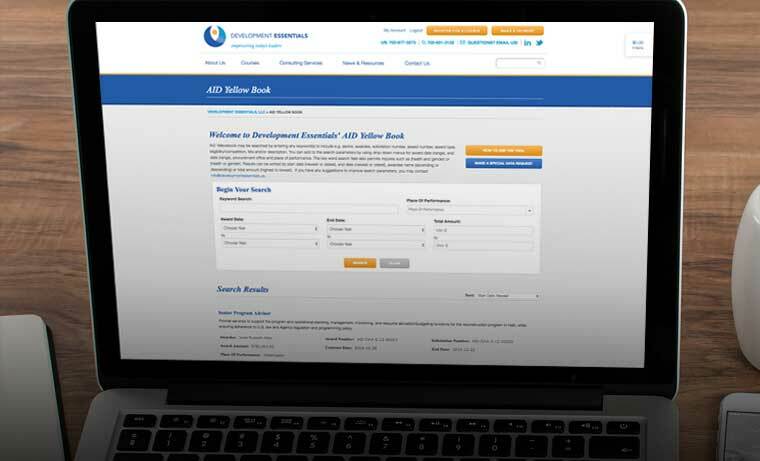 Development Essentials brings the critical tools via an interactive course format to field practitioners for a modest price, balancing the perspectives of the field and headquarters to advance your programs. Chris is a 1984 graduate of the U.S. Air Forces Academy in Colorado Springs. Prior to admission he was an aircraft mechanic and attended the U.S. Preparatory Academy. While on active duty, he served in Operation Desert Storm, Spain and Italy and in the U.S. as an aircraft maintenance officer managing up to 800 personnel supporting 75 aircraft. In 1997, Chris joined the U.S. Agency for International Development and the Bureau for Humanitarian Response’s Office of Transition Initiatives, a newly formed office responding to the needs of priority countries emerging from a political transition. Over eight years Chris drafted technical documents for contract and grant awards and as an evaluation committee chairperson led the technical evaluation, while supporting the Office of Acquisition and Assistance with cost and price analysis and negotiations. Following award, Chris also assisted with program start-up, management and close-out for programs based in the Philippines, Indonesia, East Timor, Peru, Kosovo and Iraq. In January 2005 Chris joined the Foreign Service as a Contracting Officer (CO) assigned to the East Africa Regional Mission, Nairobi Kenya. As the principle CO for the Kenya Mission, a $480 million portfolio, he supported the President’s Emergency Plan for AIDS Relief, the Presidential Malaria Initiative as well as all five mission teams. In this position, Chris drafted solicitations, oversaw evaluations, conducted negotiations, provided award administration and close-out to 50-70 awards annually. He has in-depth experience with various awards to include contracts, task orders, cooperative agreements, grants and associate awards. Throughout his career he continued to advance his knowledge with advanced course work and independent study. While in Kenya Chris also served in the U.S. Air Force Reserves as a major, implementing bilateral military programs and developing grants for partner African nations. Chris founded Development Essentials in 2012. View the Course Calendar or contact us for more information.